Welcome to the Canoe Trail shop. Please note this trip is for min of 6 people due to the time and distance spent travelling. This is full day paddle but importantly at a leisurely pace, on a slow and meandering part of the river from Great Barford to the Riverside Town of St Neots. It has 3 portages, places you will need to carry your boat around a weir and lock and has several places of interest on the route including the St Ivel tributary, The Rivermill Tavern Pub at Eaton Socon and the Ambiance Café at the end. 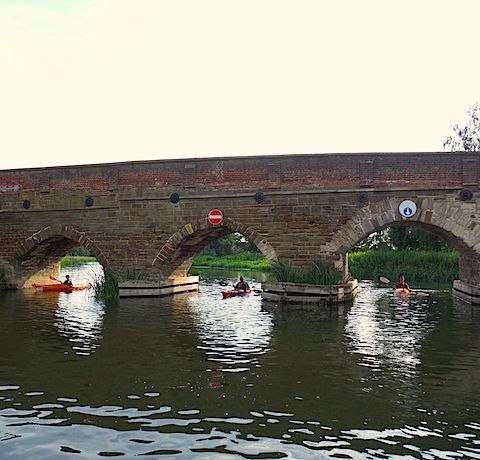 If you are interested in our multiday paddling trips or planning to stay in St Neots then you may be interested to note that there is a Camping and Caravan Club campsite adjacent the banks to the river on your route. This section of the river is quiet and slow moving with lots of wildlife. It is listed as a great wild swimming spot with clear deep water with fluttering reed beds. Although only 8.5 miles it offers the opportunity for families and groups to paddle leisurely and perhaps plan a picnic or lunch stop on route. © Copyright Canoe Trail Limited. All rights reserved.